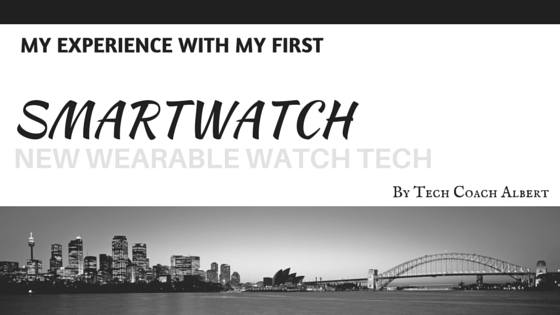 After a month of using a smartwatch, I give you my thoughts and experiences. A Smart Watch? Are you kidding me? I’m always intrigued by new technology. I wouldn’t be the Tech Coach if I wasn’t. I’ve been eyeing the whole “wearables” tech for some time now. I’ve been using a FitBit Flex for over a year and a half. It’s like a part of me now. But, I’ve always wanted something more. More than just a step tracker. More than just a movement tracker. I wanted to at least know the time. But, I wanted more info than that too. Then comes all the Smart Watches. So many variations. So much hype. Kickstarter’s galore. Apple premiums. Android variations. The one thing they all had in common for me? They all cost too much to just experiment with. Don’t get me wrong. I LOVE technology. I love gadgets. I love toying with new things. I love seeing data being collected and analyzing that data to make things better. But, I love being budget friendly even more. I didn’t have $250 to spend on the various Android watches, let alone double that for an Apple watch. It’s just not in my families budget, and that’s more important to me than my need to play and learn. My family comes before my needs. That’s how it’s supposed to be for us Dad’s, right? I’m an avid SlickDeals.net member. I watch the site all the time and have numerous alerts set up to notify when certain items come up on a good deal, or better yet a slick deal. Well, along came a notification for an LG G smartwatch. Now, it wasn’t the newly famous “round” one, but the standard rectangular one. Interesting, I thought to myself. So I pulled up the link and it brought me to the thread where they were discussing this so called slick deal. Great reviews by other users. A lot preferred it over most other smartwatches on the market. But, then I seen the price, fifty bucks! Other’s commenting on the fact it’s a STEAL at that price. I didn’t wait any longer. I clicked the link and bought one. I trusted my fellow slickdealers. They’ve never steered me wrong in the past. You want honest reviews on something? Find a deal for it and see what they say. They’ll let ya know if it’s junk or a deal. But honestly. At $50 for a watch that retails around $200-$250 I didn’t have high hopes. Sometimes deals are too good to be true. But, I figured it’s worth a shot. I’m not out anything but a few minutes of my time researching and going through the shopping cart process. I’m ok with that loss if it doesn’t come through. Fast forward about a week and a half. A box sitting delivered to me at work. hmm.. I thought to myself. 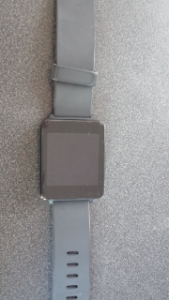 Could this really be the watch? So I ripped it open and sure enough. A brand new, sparkly, gorgeous LG G watch. Perfect to match up with another recent slick deal, an LG G2 smartphone. I charged it up, turned it on. Easily paired it. Started using it. And guess what? I’ve loved it! So after around a month of every day use, here’s what I’ve found to be the best things about having a smart watch, the bad things, one ugly thing and a few other cool apps I’d recommend for new smartwatch users. I’m not kidding when I say this is one of my favorite features of having a smart watch always ready at my disposal. I don’t have to open Evernote, or my Wunderlist app, or even my phone to jot down a reminder. Pen and paper you say? Who’s got a pen and paper always on them? Not me. I hate carrying things in my pockets. But just use your phone you say. Right? No way. Too cumbersome. Not fast enough. I need something that I can just document it. Right then. Right there. Like a personal assistant. Always by my side. Always ready to jot down that remind me at 3pm Tuesday to drop the DMV papers off in the mail comment. And, best of all. I don’t have to have that assistant follow me to dinner, the bathroom, in the car, etc. My watch is always right there. A flick of the wrist turns it on. A quick OK Google gets it ready, and a simple Remind me to put the pizza in the oven at 5:30pm sentence finishes the job. The second best feature in my book is the quick reply feature to SMS or other messaging services. My fiance shoots me a message on my drive home from work ‘On your way?’ and a simple tap on the watch and a “Yes Ma’am. Be home in 5.” is all it takes. Now, I’ve not had the best experiences in the past with Voice to Text technology. It’s been a pretty pothole filled road on that one. But I must say, they’ve nailed it down with this one. It’s only got a couple words wrong in all my messages and reminders. If I recall my experience in the past, it was more like only a couple right! This is near the top of my list too. I like being able to see everything at a quick glance. The default watch faces give you a simple time option. Maybe a date option as well. They’ve got a number of different looks. Whether it be an analog diver style watch or a more modern digital. Everything to suit your fancy. But what I like is the custom watch faces that some other developers have come up with. My favorite? The InstaWeather for Android Wear watch faces pack. 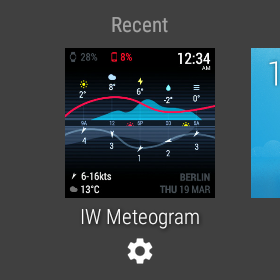 They’ve got several styles to choose from, but my favorite is the IW Meteogram face. This face not only shows me the time, but my watch and phone battery percentages. Weather outlook for the next 12 hours (Temp, Sun/Cloudy, Moon phase). Sunrise/sunset. Precipitation estimates. Wind speed and direction. Location and the date. So freaking cool. Yeah, it’s nerdy. I know. One of the other features I try and use is the Sleep tracking compatibility of the watch. I use it in conjunction with the Sleep as Android app by the Urbandroid Team. This app helps me in two ways. It uses the accelorometers in the watch to track my sleep cycles, and it utilizes a smart alarm. Where it can wake you when you are not in a REM cycle. Which translates to you’re body isn’t in a deep sleep, so it’s easier to wake up. I may wake up 10 minutes before my normal alarm would have went off, but I sure don’t feel as groggy! As one of the major benefits to a smartwatch is you can see the notifications from your apps on the watch, instead of requiring you to pull out your phone every time it beeps or vibrates. Now with a simple flick of the wrist I can easily see what my recent notifications are. Much less disruptive looking at your watch to see if that vibration was an important text from your Fiance or an old friend liking a picture of yours on Facebook. One of the major drawbacks with any electronic device is how long the battery life lasts. The LG G watch has a number of features you can tweak to squeeze out an extra couple hours of life, and I’ve flipped em all on. It’s no longer “always on”, but now a flick of the wrist enables the screen. Brightness setting is near its lowest, which is fine since I’m indoors most often anyway, and even in the outdoors is still pretty easy to read. But what does that mean? I get about one and a half to two days of usage before I have to throw it back on the charger. Good thing it charges rather quickly! A lot of the other phones I seen don’t even last that long. Which even though this is a Nope in my book, its still better than most! Yeah. So… umm… I did mention up above I had one UGLY thing to reveal. And I’m not so happy to share it. I’ve already cracked the screen. :cries: I wanted to get a Tempered Glass screen protector, but they had mediocre reviews at best. I was doing my research for an alternate screen protector but still wearing the watch daily. Sure enough, I cracked it. A single crack. The good news is you can only really tell when you look at it from a side angle. It doesn’t hinder any usage of the device, it doesn’t block my vision. Sometimes I even forget it’s there, but alas. It is. Hopefully they can find a more durable solution for this problem. Even though this is the FIRST screen I’ve broke on any of my devices. Smartphones included! So other than the cracked screen (my fault for being a bit careless), and the not so great (but better than others) battery life, I’m diggin the smartwatch world. Happy as a clam I was able to get one, and at such a great deal. Happy to report I forget to do things much less frequently thanks to the simple ease of adding reminders and also find I’m not pulling my phone out of my pocket nearly as much to check for messages or missed calls. The only other thing I forgot to mention is the fact people are always asking is that one of those fancy apple watches?. Nope. It’s not. It’s an Android watch, does just as much, and a at fraction of the price!